UPDATE: Remembering Tonia: A Christmas Prayer concert! The concert is a go! 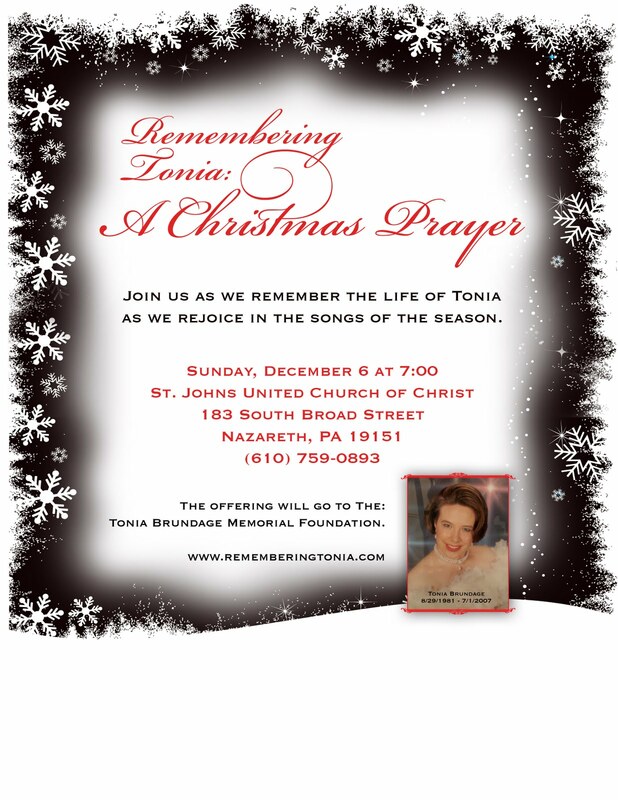 We would like to invite you to attend Remembering Tonia: A Christmas Prayer on Sunday, December 6 at 7:00 pm. We will be using this concert as the kickoff for the Tonia Brundage Memorial Foundation. This is the non-profit group that we are working on establishing. I know that most of our friends can’t physically be at the concert but I also know that you are all prayer warriors. Please be in prayer for the people involved, for travel and for all of the details. This is going to be a very special evening. If you are able to attend, let me know! This will encourage all of us and also give us a chance to say hello in person! Save the date! There will be a Memorial concert held on December 6 at St. Johns United Church of Christ 183 South Broad Street, Nazareth, PA 19151. Their phone number is (610) 759-0893. Tonia’s high school friend, Karla, wanted to do something in memory of Tonia. 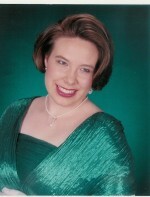 Last summer she sang at a benefit concert for a local woman’s shelter and dedicated one of the songs in Tonia’s memory. She created a poster with pictures and had it there with her. This year she wanted to do more. Tonia graduated from Nazareth High School in 2000. A bunch of her friends did not learn of her death until after the funeral. Slowly we have been hearing from these friends via email, by phone and even through this blog. It has been very sweet to hear the stories about their antics during high school and see some pictures from then. That brings us back to this concert. It will be held at Karla’s church. We will be there of course: to cheer her on, to meet Tonia’s friends face to face, to cry, to rejoice, to remember! What a perfect way to remember Tonia through the songs that she loved. There is no fee to get in but Karla will asking for a love donation to cover expenses. She asked us what we wanted to do with any left over donations. After much thought and prayer we have decided to create a new non-profit organization in Tonia’s name. I have been in touch with our accountant and we will be starting the process very soon. The foundation will support our desire to help other family members and friends heal after the loss of a loved one through a sudden violent death. The goal is to help others find healing through God’s grace. More details will be available soon! So if you are in the area please come out to see us, to hear some wonderful Christmas music and to share in the joy of remembering.